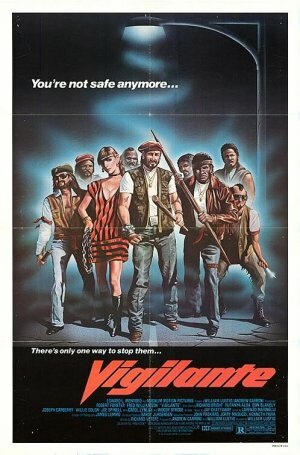 Tag line: "There's Only One Way to Stop Them..."
Released two years after his controversial horror film Maniac, director William Lustig’s Vigilante is a tense crime thriller shot on the streets of New York that also features one hell of an all-star cast. Factory worker Eddie Marino (Robert Forster) has his entire world taken away from him when his wife Vickie (Rutanya Alda), who tried to stop a gang from beating up an old man, is attacked by that same gang, a showdown that claims the life of the couple’s young son Scott (Dante Joseph). The gang leader, Rico (Willie Colón), is eventually arrested and put on trial for murder, but his sentence is suspended by the judge (Vincent Beck), and that very afternoon he’s back on the streets. When Eddie protests the verdict, he is charged with contempt of court and sentenced to 30 days in prison. With the help of longtime inmate Rake (Woody Strode), Eddie survives his incarceration, and soon after his release he teams up with co-worker Nick (Fred Williamson), who, along with buddies Burke (Richard Bright) and Ramon (Joseph Carberry), has taken the law into his own hands, beating up rapists and hunting down the goons that sell drugs in their community. With Nick’s assistance, Eddie sets out to take his revenge on the gang that destroyed his family. But will the grieving father stop there, or will Eddie's thirst for justice turn him into a full-time vigilante? As he did with Maniac, William Lustig shot Vigilante on location in New York City, traveling to some of the area’s less hospitable neighborhoods to give the movie a down-and-dirty, grindhouse feel (at one point, Nick chases a drug dealer through the graffiti-decorated remains of a community pool, a scene that’s among the film’s best). This, along with a story that borrows heavily from the 1974 box-office hit Death Wish, makes Vigilante a sure-fire crown pleaser, with citizens taking the fight directly to the criminals (during the movie’s first half, Nick and his cohorts extract information from a series of low-level dealers and pimps, all in an attempt to learn the identity of the city’s drug kingpin). Yet it’s the fine work turned in by the cast of Vigilante that brings it all together, taking what might have otherwise been a routine thriller (citizens hitting back when the system fails them) and transforming it into something much more substantial. Robert Forster is convincing as the angry family man who tries the legal route first, only to have it blow up in his face. But it’s Fred Williamson as the leader of the vigilantes who really stands out. In the opening scene, Williamson’s Nick delivers a passionate speech to his neighbors, saying they have to look out for themselves; and he regularly ignores the warnings of local policeman Gibbons (Steve James), who tells Nick that he’s pushing back too hard, and may end up in jail himself. In addition to the two leads, Maniac’s Joe Spinell has a small role as a scumbag public defender; and Woody Strode is strong as the inmate who watches over Eddie during his 30-day prison stint. Vigilante was one of only three movies that Lustig directed between the years 1980 and 1988 (it was sandwiched between Maniac and Maniac Cop). And while his output during this period may have been sparse, the films he did manage to make are all high-quality, each with a grittiness that, even today, resonates in every scene. Damn. Once again, a film I've never even heard of. I'll look this one up. Sounds like a good example of the what I call the myth-of-the-benign-Fascist.